Flight or fight. An age old, built in response mechanism that allows our brain to quickly rationalize and respond. When faced with a life or death situation, your heart and lungs accelerate, your mouth goes dry, and you suddenly have a newfound respect for those who would normally drive you to drink. My current situation was grim, no doubt about it. I’d been in many tough situations in the recent months that would have made a saner person step back to reconsider their life goals. This one probably took the cake. Kidnappers I could handle, being held at gun point hadn’t fazed me too badly. But this might be pushing the barrier. The clues were right in front of me, yet I’d refused to take a closer look. In the end, my naivety would be my undoing, and judging by the long handled knife that was now kissing the edge of my skin, things were about to get a whole lot worse. When I was a teenager, the thought of an approaching holiday like Valentine’s Day would fill me with both excitement and dread. Excitement for the possibilities surrounding the day of love, and dread knowing those possibilities were probably not in the cards for me. Being a single girl in a small town like Riverdale, Iowa, my options were pretty limited to stoners, jocks and the occasional egghead. You can see my dilemma. This year, things were different. I was in a relationship even my mother was proud of, and though we’d gotten off to a rocky start, things were going pretty well. Lucky for me, rocky starts happen to be what I excel in. My name is Taci Andrews, and I’m an investigative reporter for the Riverdale Times. This past year has been rough, to say the least. As with any job, being a reporter for the Riverdale Times has its ups and downs. The pay is good, there’s always something interesting going on, and I have a coworker who keeps me plied with coffee and doughnuts. Those would be the ups of the job. The downs consist of being shot at, nearly blown up, kidnapped, drugged and, of course, kidnapped again for good measure (I think the bad guys were running out of ideas on what to do with me). Remarkably enough, I’ve managed to go three months without any downs of the job occurring. An amazing feat according to my boss, Bryce Pierce. He has a calendar on the wall in his office that he marks with a big red X at the end of each day that I go without incident. It’s sad, but true. With the Midwest temperatures for February keeping any evil doers at bay, things have been slower than normal at work and I’ve been able to turn my attention to a new rite of passage. You guessed it. I, Taci Lynn Andrews, was about to purchase a Valentine’s Day card for my boyfriend, former Fireman and current FBI Agent, Tony Parsons. My relationship with Parsons began back in grade school when he looked up my skirt during the school Christmas Pageant and told everyone about my little pony underwear. I gave him a black eye. Years later, during a moment of raging teenage hormones, I let him feel up my shirt, which I later came to regret when he told everyone my cup size. In turn, I gave him another black eye. Fortunately for him, I’m a forgiving kind of girl. It probably helps that the man in question has grown up to be sinfully handsome with deep blue eyes that darken when he’s turned on, dimples in each cheek that make my heart do a weird flip, and a rock hard, well-muscled body that makes my girlie parts quiver. He also happens to have a full set of delicious lips that he’s used on more than one occasion to kiss me senseless. What can I say? I’m a sucker for a guy who knows how to kiss. Anyway, that’s Parsons in a nutshell. He also happens to be bossy and overbearing when it comes to any trouble I manage to find myself in. Probably for good reason, considering the trouble I typically find myself in is usually the deadly, bad for my health, kind of trouble. I stared at the rows of cards lining the rack in front of me, chewing my bottom lip. Heart shapes, puppy dog faces and smooching lips stared back at me, as if mocking my decision at every turn. I don’t know why picking the right card for Parsons was so important, but I felt like the weight of our relationship rested in the balance of a piece of card stock. Lame, I know. After reading through over a dozen cards and discarding them one by one, I was beginning to lose hope of ever finding the right card. That’s when I spotted it, a kitten with soulful eyes staring up at me, beckoning me in for a closer look. Reaching out, I pulled it free from the rack just as the woman standing next to me made a grab for it. “That’s mine,” she snapped, keeping a firm grip on her end of the card. Despite the bright smile I flashed, the ladies eyes narrowed, and her grip tightened. “I don’t think so. My hand was on it first, and as you can see, there isn’t another one in the bin so you’ll need to pick a different one,” she insisted. Hard as it was, I managed to keep my mouth from falling open. Was she serious? Now, this would be the part where a normal person’s common sense would kick in and tell them to just let go of the card. It just so happens that I’m sorely lacking in the common sense department. Instead, mine was replaced by a sheer will of determination to purchase the card gripped tightly between my thumb and first finger. “I hate to break it to you, but I had it first, so it looks like you will have to pick something else.” I gave the card a tug for emphasis. People stood off to the side, watching the debacle going on in the card isle. We were making a spectacle and I really didn’t care. There was no way this rude woman was getting my card. “I’ll tell you exactly what I’m going to do about it…” My voice trailed off as I took a menacing step forward, coming to an abrupt halt when a strong arm snaked around my waist, bringing me up short against a well-muscled chest. The card slipped from my fingertips as a very familiar, very musky cologne filled my nostrils, and I knew, without looking, who had interrupted the card war. “Causing problems at the grocery store? Tsk, tsk, Angel Face, that’s not like you at all.” His deep voice rumbled in my ear. I couldn’t help it. The sound of his voice made my toes curl inward and a suspicious warmth flood my body. I threw a glance over my shoulder, taking in Parsons’ profile. And what a profile he had to behold. I knew for a fact beneath the rugged lines of the form fitting jeans and firefighter muscle t-shirt lay a body that was sinful in itself, as I’d been up close and personal with it on more than one occasion. Lucky me. “You know me, I make do wherever I am.” My voice came out a bit breathlessly, the feel of his warm breath tickling the back of my neck causing the hairs to stand on end. My teeth ground together, and I’m pretty sure steam escaped my ears. Knowing my temper well, Tony’s arm tightened on my waist, a silent warning that there was no way he was about to let me go. “Absolutely ma’am, I’m happy to help.” I knew without looking that he was flashing his dimples, because the woman got all giggly and had the grace to flush. I seriously contemplated stomping on his foot. Instead of doing Parsons bodily harm, however, I watched the card thief saunter off to the checkout line with my card clenched tightly in her hand. Tony’s arm loosened around my waist, though he retained his hold on me. He probably expected me to vault after the thief and retrieve the card. A tempting thought. “I was, but since you let that woman take off with my card, I don’t know if I feel like finding you another one.” I poured as much sugary sweetness into my voice as I could, rewarded when he chuckled before leaning down to drop a kiss on my upturned lips. Seeing that the excitement was done for the day, the crowd began to disperse, returning to their grocery shopping. “You could always do something original, like make me coupons with sexual favors that I can randomly cash in.” He wiggled his eyebrows. His mention of my health was a sobering reminder. We recently had a pregnancy scare when my period came a week later than normal. Thankfully, it was all due to stress and not the fact that we had a bun in the oven. Someday I would love to have kids. Now was not the time. He shrugged, eyes flitting away. Oh boy. Parsons had an uncanny knack of changing the subject when he didn’t want to answer a question. I got the feeling something was up. Since there was no way I was going to look for a card with Parsons hanging around, I headed towards the exit. Call me crazy, but there was just something tacky about your boyfriend watching you pick out the card you’re planning on giving him. When Tony first came back to Riverdale, he was working undercover for the FBI as a fireman at Central Fire Station. It just so happened that the shady characters who were under his radar ended up being tied in with the story I was working on. What began as a story about a missing girl, evolved into a drug ring bust, illegal profiteering and eventually attempted murder, all with the Mayor of Riverdale pulling the strings. At the end of the day, we put an end to the Mayors’ corruption, I didn’t end up in the city morgue, and I landed a hot boyfriend to boot. The only thing overshadowing that happiness was the betrayal of my childhood friend and former police officer, Charlie Duncan. It turned out Charlie was also involved in the Mayor’s criminal ring and had moved back to Riverdale to oversee management of the Mayor’s group. When the party came crashing down, Charlie managed to escape authorities and was still at large. “What about me?” I paused next to my Honda Civic, regarding him with interest. “Does that mean you won’t be around when I need a back massage? I couldn’t help it. My body tingled. “So, I’ll see you later tonight then?” I leaned in to trail a fingertip along the front of his chest. Instead of an answer, he pressed a kiss to my mouth that included a whole lot of tongue before he drew back. “You’ll see me later,” he promised, sneaking in one more kiss before turning and heading to his truck. I watched him go, my body on overdrive and thoughts centered on what the evening would bring. Parsons may be bossy and overbearing, but he definitely had one thing going for him. The man was a God when it came to his prowess in bed, and he had this girl wrapped around his little finger. 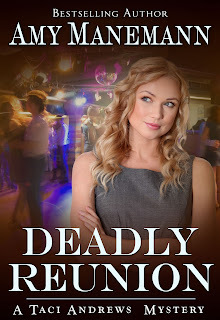 Read where it all began, pick up your copy of DEADLY REUNION today!